Growth of 3D printing has ushered the growth in material technology and this has resulted in development of a multitude of filaments for 3D printing. However, some basic materials are used on a large scale than some of the most recent and innovative materials developed by material scientists. Here, we take a look at some of the most common 3D printing filaments available in the market. Polylactic Acid (PLA) is one of the most common 3D printing filament around the globe. The main reason being the ease of operation, it is affordable and is environment friendly. It can easily biodegrade in 50 days in industrial composters. It is made from plant-based starches and are generally food-safe but still it is advisable to check the safety with the manufacturer before such a use. It does not give out fumes as is the case with ABS. It sticks to the bed easily which helps in faster printing speeds. However, PLA is not suitable for parts with continuous exposure to heat as it has low heat resistance compared to other filaments. Acrylonitrile butadiene styrene (ABS) is an industrial material and used in many household equipment’s. ABS also is one of the most common 3D printing filament. The most famous application of ABS is Lego bricks. Since this material is already used by many polymer industries, it is mostly used for industrial prototyping. ABS has high temperature resistance and good impact resistance. ABS has the added advantage that on treatment with fumes of acetone the outer layer melts and we get a smooth & glossy surface finish. ABS is a toxic material and it gives out toxic fumes while printing so it is recommended that printing should be done in a properly ventilated room. ABS is prone to warping and cracking at edges, so a heat bed is essential to print with ABS. This helps in keeping the printed layer hot avoiding the temperature difference thereby having a stable print experience. Polyethylene terephthalate (PET) is a transparent, strong and highly durable filament. PET is the same material from which mineral water bottles are made. PET has many variants like PETG, PETT, PET+, PETP, PETE, etc. By addition of chemicals the PET materials are called by various other names which also modifies their properties. They closely resemble each other but offer different levels of strengths. PETG is formed by addition of glycol. Glycol helps the PET material become brittle and eliminates the hazing effect seen during printing. This helps in achieving a comfortable grip on the product but this also renders it susceptible to damage due to UV light. Generally Polycarbonate (PC) is used to make a lot of household items like containers, flasks, vitamin shaker bottles and even used in manufacturing of bulletproof windows. PC exhibits high resistance to heat and is stronger than most of the filaments. It has a high melting point and so the extruder temperature also has to be pretty high with the need for a heat bed. Nylon exhibits high strength, high tear resistance and has excellent surface bonding. It can be easily dyed with needed colours. Nylon is less brittle than PLA and ABS. Most common applications of nylon are in Prosthetics. It has high melting points and so it can sustain friction heat generated during rubbing of adjacent parts. This helps nylon to be used in gears. It is also one of the most durable materials from among the filaments. With all the advantages, nylon has its share of drawbacks. It is difficult to print with nylon as it has higher shrinkage rates than other materials. It is recommended that nylon be printed on Garolite print beds for better control. The print speed for nylon is low. 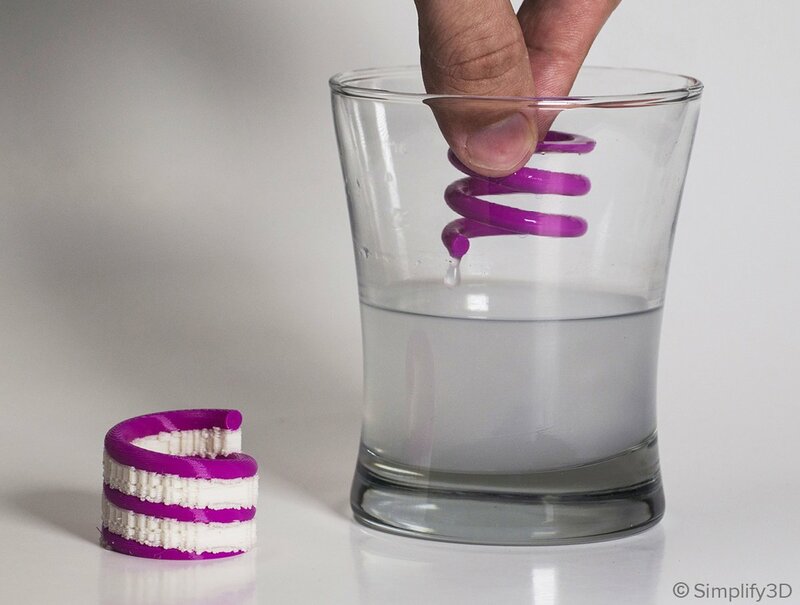 Polyvinyl Alcohol (PVA) is one of the most common 3D printing filament used as a support material. 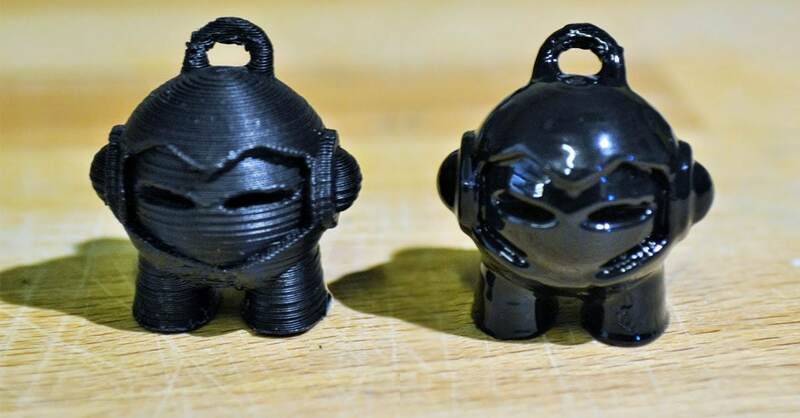 Since it is a water soluble filament it is ideal for use as a support material and rarely used as an independent material for printing any part. Even though it has better ultimate strength than most other filaments including PLA, ABS and Nylon, it is not a mainstream building material. It should be stored in dry conditions as humid conditions can deteriorate the material. Another most widely used support material is High Impact Polystyrene (HIPS). It closely resembles ABS but it is dissolvable in a chemical called as Limonene. Unlike PVA, HIPS is also used as an independent material as it shows good durability and high impact resistance. It has stiffness comparable to Carbon Fibre. HIPS requires a heat bed and so it is generally used in combination with ABS. ThermoPlastic Elastomer (TPE) & ThermoPlastic Polyurethane (TPU) both are flexible filaments. Both these filaments are more or less similar but offer different properties. The only major difference is rigidity TPU offers which helps while printing with flexible filaments. The flexible filaments offer high elasticity and flexibility like rubber. The printed part upon application of force is easily bent and twisted and the part returns to its original shape upon removal of the force. 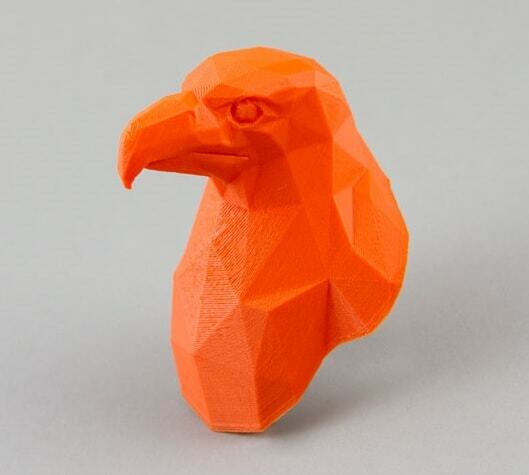 Flexible filaments are difficult to extrude and so the print speeds are extremely low. About Manufactur3D Magazine: Manufactur3D is the first online 3D printing magazine in India. We offer 3D printing news in India, analysis and insights from the 3D printing world of India. Check out our 3D Printing Info page for more information on 3D printing.